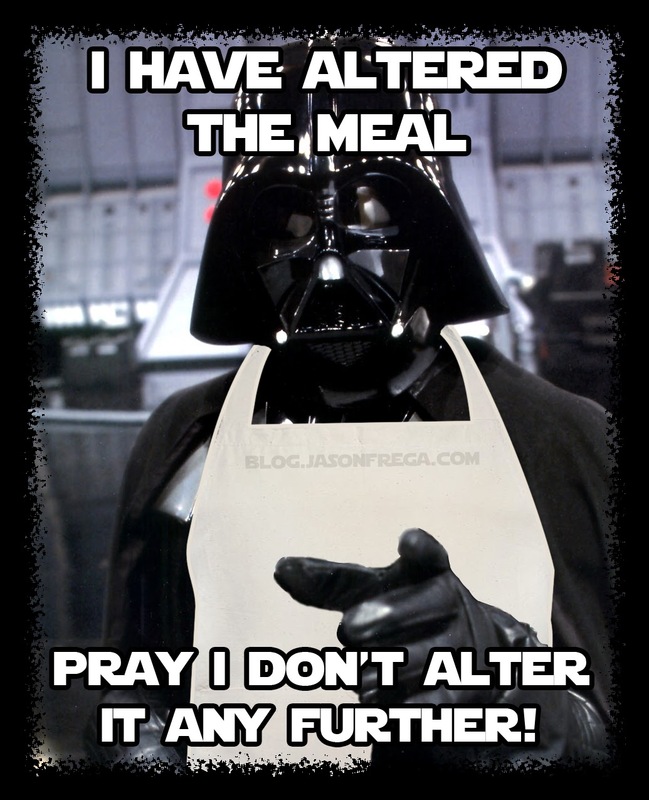 Pray I Don't Alter it Any Further! I've absolutely loved my Mom's chili for as long as I can remember. In fact I've absolutely loved most chili that I have tried over the years, yet I've always gone back to my Mom's as being my favorite and the absolute best I have had. 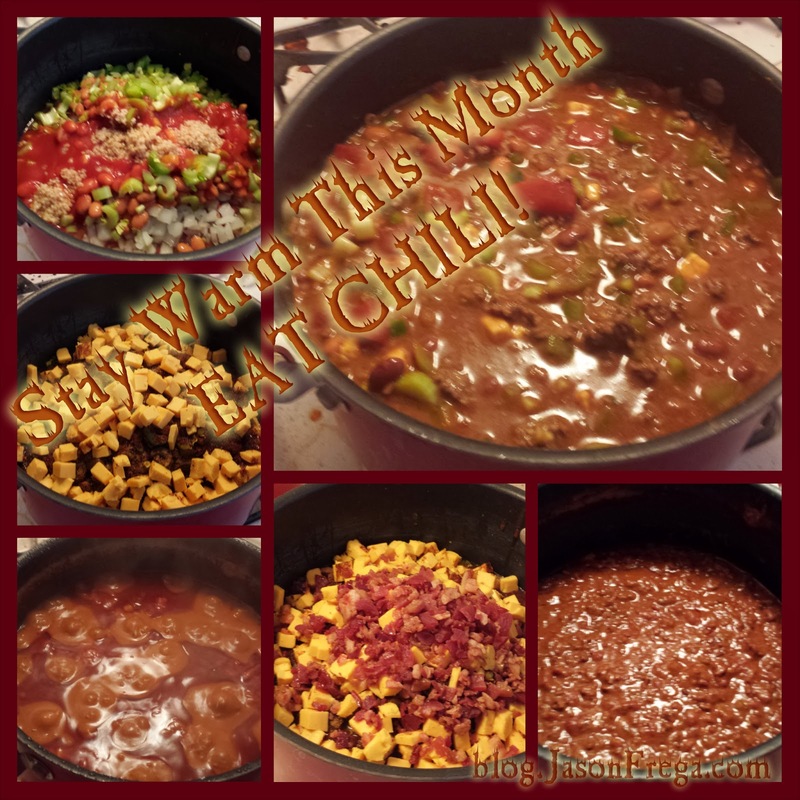 The last several years I've been entering various chili contests and I've been changing the base recipe around a bit each year to make it more my own. I have finally settled on what I feel is the best it has been since I've started making it. And hey, why keep amazing chili to myself? Melt a large portion (two or three golf ball sized chunks) of bacon grease in a large skillet. Brown the ground beef in the bacon grease on medium-high heat. Drain the about 95% of the meat grease from the pan. Add all of the ingredients to a large cooking pot. Rinse all four cans with a small amount of water (about 1/8 can each) and add the water to the chili. Stir extremely well and set heat to high. Bring chili to a boil. Set heat all the way low and cover the pot. Simmer 5 hours or longer as needed stirring occasionally. Add your favorite toppings (I like cheddar and oyster crackers) and enjoy! Leave me a comment below on any alterations you make to the recipe and how it went. Share this post with all of your fellow chili lovers. Since 90 percent of anything is crud, likewise 90 percent of the alleged leaders [...] are producing cruddy results. It's not that people are crud. In fact, they may be part of the 10 percent in other areas. [...] Understanding Sturgeion's Law helps us study the leadership teams honestly and not be fooled by the endless talk with no results. "When all is said and done, much more is said than ever done." The 10 percent walk while the 90 percent talk. Now I think there are many factors that play into why most of us don't succeed in our resolutions. One reason may be unrealistic resolution setting. Number nine in the top ten resolutions for 2014 is "To fall in love." Now, maybe some of you are good enough to force something like that into existence, but I for one was blessed with that. 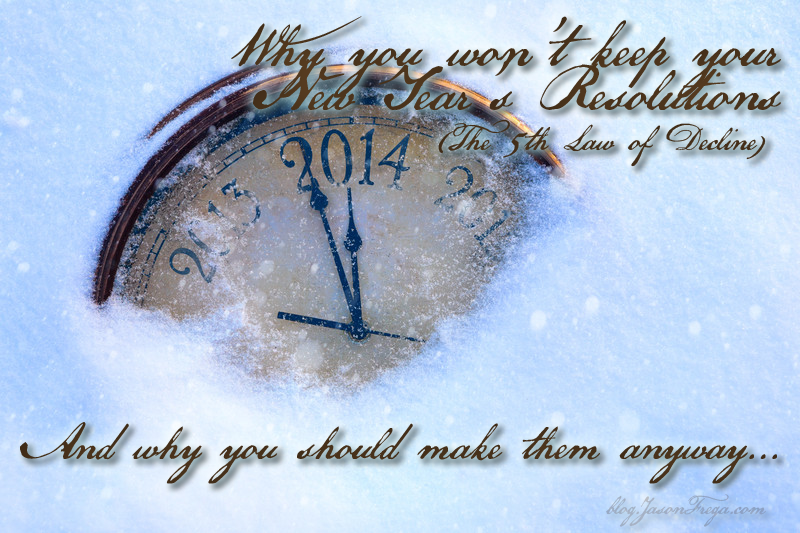 So resolutions that one has little control over may be a very low success rate before they're begun. Another thing people may do is take on too much or overestimate what they can accomplish in a short time frame. 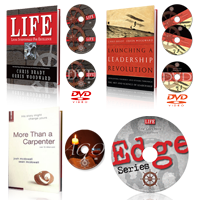 Best selling author Chris Brady says, "Most people highly overestimate what they can accomplish in one year, yet they greatly underestimate what they can accomplish in five or ten years." That is to say, set reasonable goals for 2014, ones that can be accomplished in a years time, and set large goals for the next five years and begin work on them now! I'm not at all implying to dream small. Heavens no! Dream huge! Dream a dream and set a resolution that will cause you to have to change, grow, struggle, and keep focused. And if you fail, fail forward. Get back up! Just set reasonable time frames for your magnificent dreams and keep them in front of you daily so that you do something each day to move yourself toward them. It took us how many ever years we've been alive to get ourselves into the messes we are in. For me, it has taken me 30 years to get myself into my mess, it's probably going to take more than one year, or even a few years to get myself out of it. Another huge reason many of us give up on our resolutions (25% give up after just one week, 36% after one month, and a whopping 54% after only 6 months) is because many people simply can't see their goal through all of the crap they're going through to get there. Think about it, if you were standing in front of a huge pile of crap would you just walk through it for no reason? If you couldn't see what was on the other side would you even enter it? What if your dream was big enough that you could see it over the pile. What if it was something worthwhile that you could keep your eye on the end result of while wading through the garbage? Make your resolutions big enough that you can still see them regardless of what you're going through. WRITE THEM DOWN! A goal that is not written down, with a date of planned accomplishment, is nothing better than a wish. You may as well toss a penny into a fountain for that one. Once you have written your goal down with a date, then you can create an actual plan of action to accomplish it with regular steps to take. I found a website called Stickk.com that has a very interesting way to help folks who have a hard time keeping goals. If you're more tech inclined use that or a similar service. But once you write your goal down, read your goals regularly. I'd recommend reading them every morning and every night, perhaps several times in between. This is a very important step to keeping the dream larger than the pile of garbage. So why create resolutions at all if 92% of us won't succeed anyway? (And curse this Sturgeon guy for pointing it out!) I mean only 45% of us usually make resolutions each year, and the minority can't be correct right? It's simple, people who explicitly make resolutions are ten times more likely to achieve their goals than those who don't. That's a significant statistic in and of itself! Think about it, is there something you want out of your life for 2014? Wouldn't you want it to be ten times more likely to come true? Write it down, read it daily, take action steps. One last fact I found interesting: 47% of all resolutions made are self improvement or education related resolutions. As people we are always changing, we are always growing or declining. There is no real static state. So with resolutions in regards to self improvement, even if a goal is not fully achieved in time you are still on a journey. You'll never truly be your best self, because you can always improve, and so can I. So why not make a resolution for self improvement? Give it your darnedest, and if you don't quite hit the goal, you'll be miles ahead of where you would have been had you not pursued it at all. If you have no idea where to start, I highly recommend picking up a copy of RESOLVED or at a bare minimum the RESOLVED Primer and start learning about the importance and impact of ongoing resolutions, how to create them and keep them. Here's something I shared on Facebook today and found motivating. Post by Jason J. Frega. Twelve months from now are you going to be exactly where you are today, except maybe a little older, a little more tired, a little broker, a little more frustrated? Or you going to move forward in 2014 and give a few resolutions an honest effort? Please share with me in the comments below what your favorite resolution has been in the past, or what you're planning for 2014. Have you ever been part of the 8% that succeeded fully? I'd love to know! Have a blessed New Years Eve and make it (to quote The Doctor) a fantastic, amazing, and brilliant 2014! That being said, doesn't that look absolutely amazing? You're thinking of how much you miss and want bacon right now aren't you? Why not just go ahead and make some of this up today, you will not regret it. I have since made this style of bacon twice and will be making two or three more batches today, varying ingredients each time to try something new. The first time I followed the original recipe closely (I used Fat Tire instead of Dogfish Head) except when I mixed the brown sugar with the beer (see below) it was too soupy and not a syrup as the original post described. I found that buy adding another 1/4 of brown sugar and 2 more tablespoons of beer to the mix it syrup'd up very nicely. The second time I again used Fat Tire, but this time I started right out with 3/4 cup brown sugar and just over 1/2 cup beer. I also noticed that the repeat process in the oven definitely takes three times exactly, plus the one time in the oven before the syrup is brushed on (see below) for a total time in the oven of 40 minutes. The third time (later today) I will add a table spoon of hot sauce (The Hot Sauce Boss Spicy Kush) to the beer/brown-sugar mixture to make it a kind of spicy candied bacon. I will probably only try this for one of the two or three batches I make today. I'm also hoping to pick up a bottle of Delirium Noel Belgian Ale to use instead of Fat Tire. I'll let you all know how it turns out once I'm done. EDIT: I was unable to acquire the Delirium Noel at this time, so I will be making tonight's batches with Laguntas Hop Stoopid. How to make it? Good question! Mix the brown sugar and beer in a bowl until it becomes a syrup. Line a baking sheet with aluminum foil and place a wire cooking rack over it. 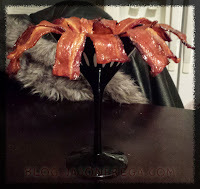 Lay the bacon strips over the wire rack, I personally chose not to overlap them. Bake in the oven at 400º for 10 minutes. 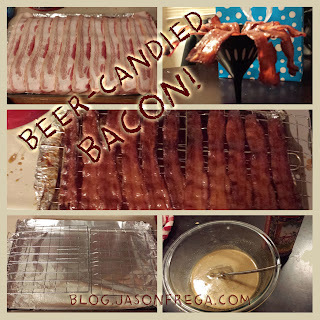 Remove the cooking sheet with the bacon from the oven brush both sides of the bacon liberally with the beer/brown-sugar concoction. Use metal tongs to flip. Return the bacon to the oven and bake for another 10 minutes. Repeat steps 5 and 6 two more times, I've found that any less is not adequate. Remove bacon from the oven and let cool for at least 1 hour on the wire rack before trying to remove. Eat the essence of magic itself. Share with others. 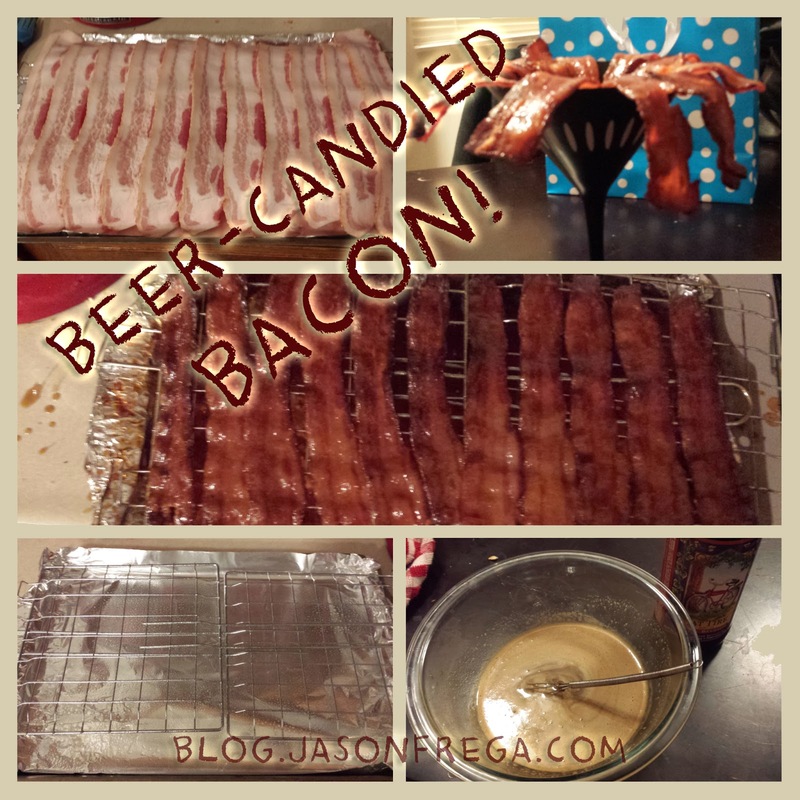 If you won't share your bacon with others (I totally understand) share with them the recipe so they can enjoy their own candied bacon that they don't share with you. Please let me know your experience, thoughts, ideas for changes or new ingredients, favorite colors, and whatever else in the comments below. I know it has been a very long time since I have blogged anything. This particular hobby has just gotten away from me. I want to blog regularly, but obviously I want other things in my life more at this point in time or I would actually be blogging, not just "wanting to". Anyway, I have been learning a lot recently (mostly from Taxidermy Worms) on being human. By that I mean learning to see beyond race and gender and the like and trying hard to understand other people's struggles. I am very new to learning about and understanding what many call the feminist movement. Learning that it's more about a battle to be seen as equals and treated as human beings and less about being angry at males. I have been opening my mind to new points of view on the struggles of minority races, social and economic classes and such. 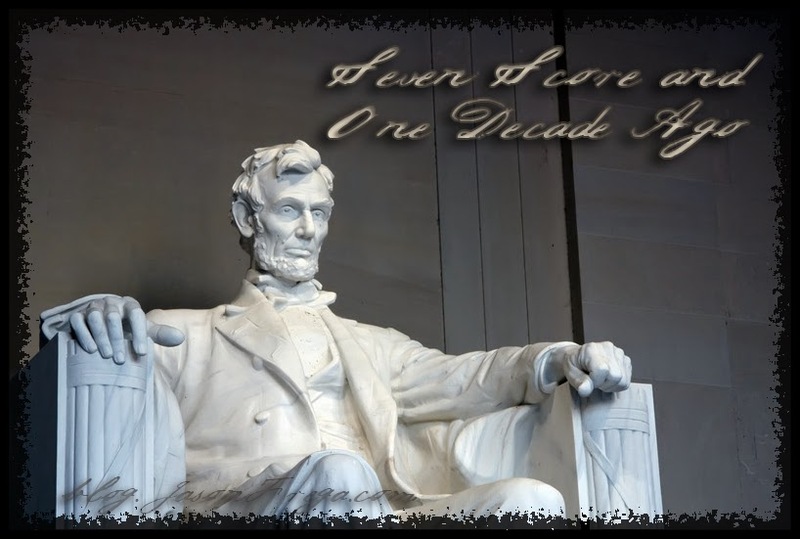 So, today is the 150th anniversary of the day one of my favorite Presidents, Abraham Lincoln, stood on the battlefield at Gettysburg and gave his short address, and this has compelled me for whatever reason to write my own interpretation of his words. Seven score and one decade ago a hero to the people he served, Abraham Lincoln, brought forth to this nation, conceived in Liberty, a great reminder of the ideal, the truth in fact, that all people are created equal. Now we are engaged in a great media war, testing whether We the People will grow to be so dedicated to President Lincoln's plea that we force change -- we stand up and lead again. We are met on a great battle-field not in a literal sense, yet within our hearts and minds. That field, for those who choose, can be a final resting place for thoughts of racism, genderism, and the like. It is altogether fitting and proper that we abhor, and should abhor, any notion that our fellow men and women are in any way undeserving of our respect and of our love. We must resolve to balance truth and love and when truth needs to be shared it must be done in genuine love. But, in a larger sense, we can not dedicate -- we can not consecrate -- we can not hallow -- the mind, the will, the heart of another. The brave men and women, some who gave their lives believing true principles of Freedom were paramount, who struggled to grow themselves, have consecrated within themselves, far above our poor power to add or detract, and yet we must do the same. We must begin with ourselves, learning to accept differences, love others, understand their struggles from their eyes. The world will little note, nor long remember what we type here, but it can never forget the victory when one person chooses great over good, significance over comfort, and the ripple ebbs and flows through generations. I have left the last two sentences of his address intact. "It is for us the living, rather, to be dedicated here to the unfinished work which they who fought here have thus far so nobly advanced. It is rather for us to be here dedicated to the great task remaining before us -- that from these honored dead we take increased devotion to that cause for which they gave the last full measure of devotion -- that we here highly resolve that these dead shall not have died in vain -- that this nation, under God, shall have a new birth of freedom -- and that government of the people, by the people, for the people, shall not perish from the earth." 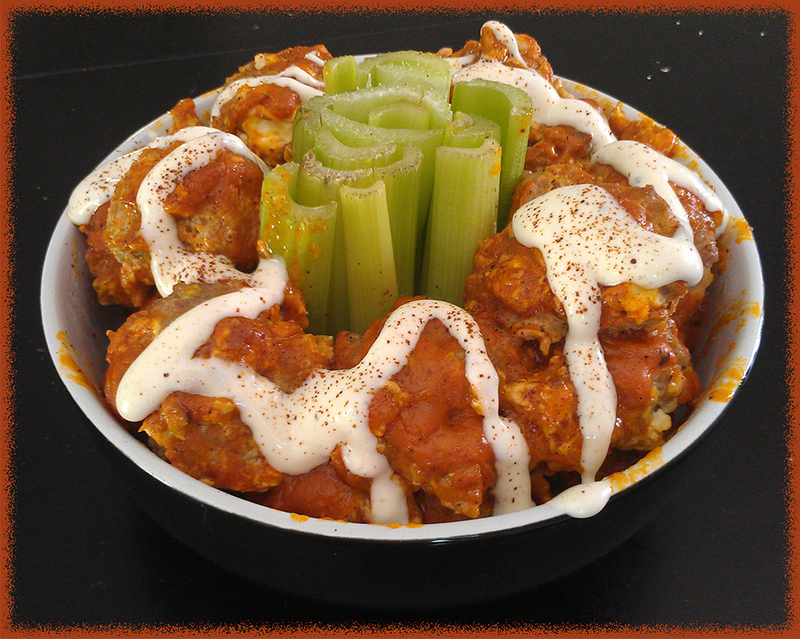 I used Buffalo Wild Wings Spicy Garlic Sauce instead of Frank's Red Hot & Butter. 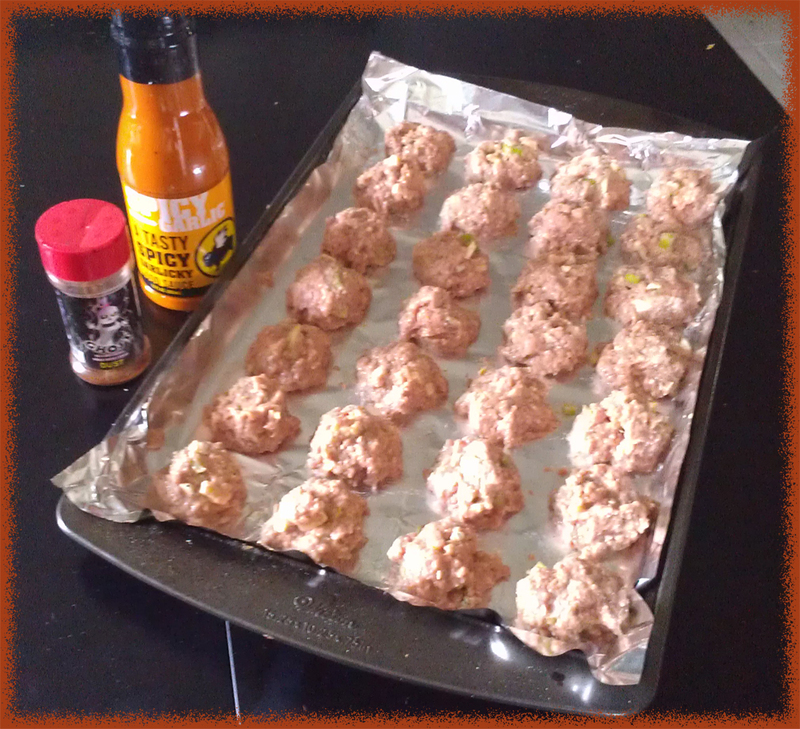 I sprinkled the top of the finished product with Ghost Pepper (Bhut Jolokia) Powder for some extra super hotness. 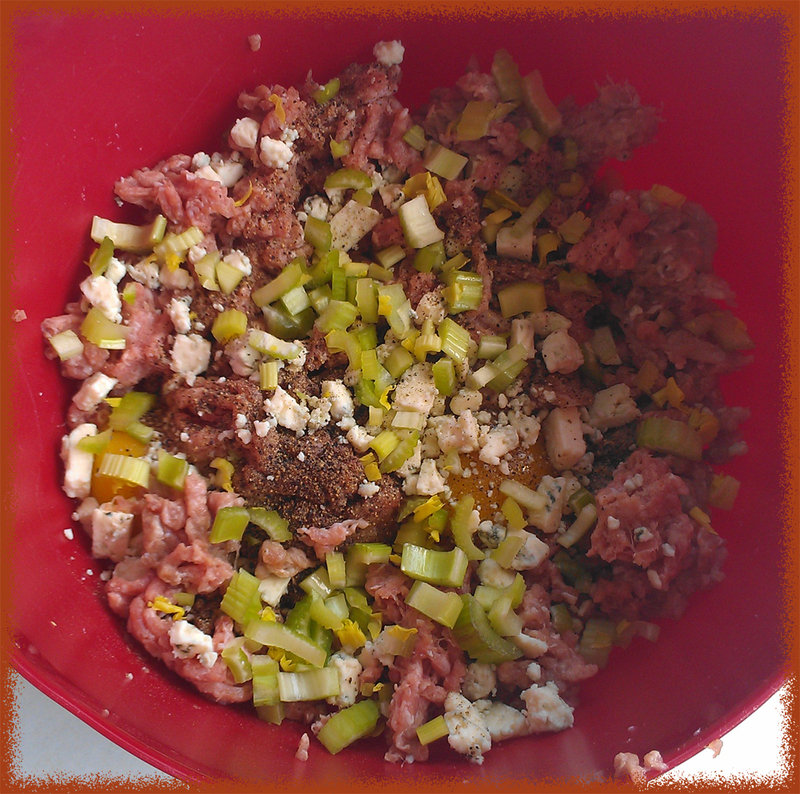 I considered adding crumbled bacon to the mixture and chickened out. 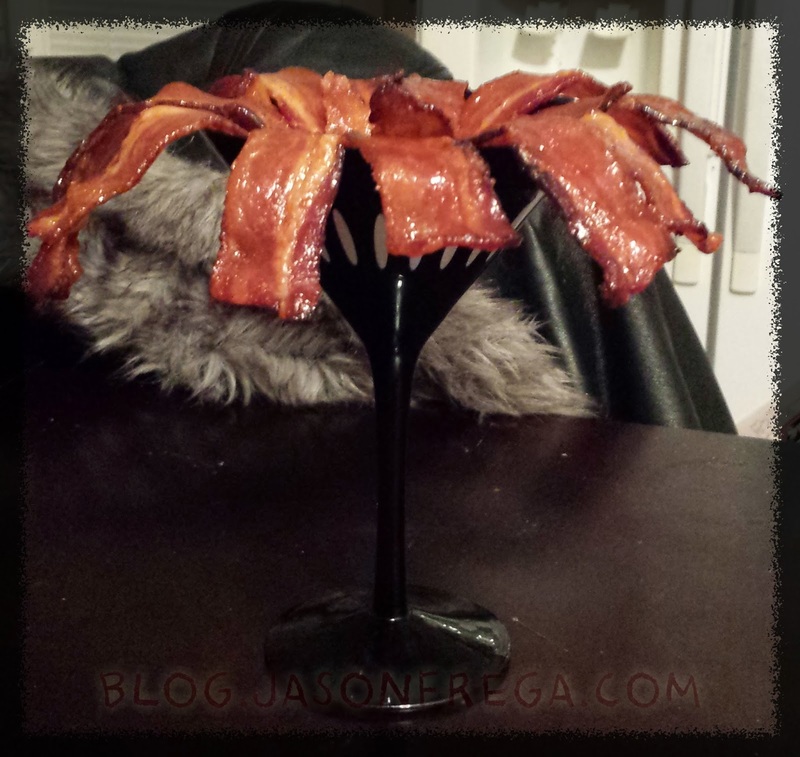 In retrospect I don't know what I was afraid of... Bacon is Awesome! Will add next time, you should your first try! 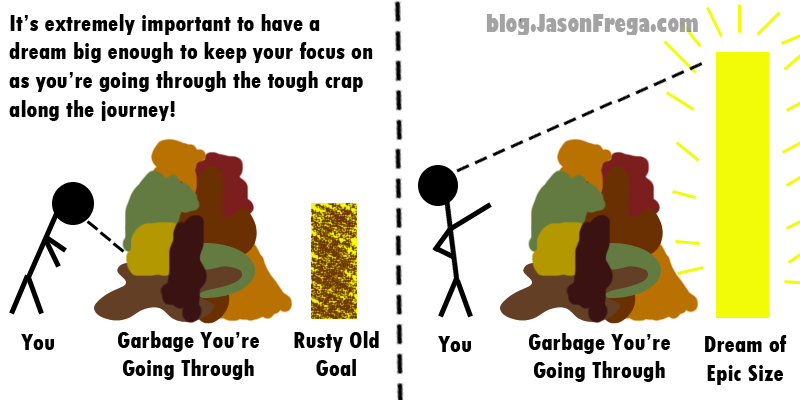 This isn't a change, but I decided to go with Turkey instead of chicken. So, I was a bit alarmed at how watery the mixture felt. Don't be, they solidified quite well during cooking. Also, never having cooked turkey balls before I thought I had screwed up when I pulled them out at 10 minutes to dip in sauce. I discovered all the extra junk was the drained turkey fat on the tray. I didn't do this, but I strongly recommend getting rid of it in between dipping and reheating the balls. These turned out fantastic for a first try. Flavour-wise I'd give them a 8/10, but the consistency is a little funny to me. I had to heat longer to help with that and even after an extra 6 minutes in the oven the consistency is not what I'm used to, so I give that a 6/10. But then again, I've never had ground turkey anything. One of the soundest investments a person can make, if not the best, is in themselves. Specifically in their mind and how they think. Material things and investments can always be lost, destroyed, or taken away but what you put in your head can reap fruit for a lifetime. This is why I have chosen to write on the topic of financial intelligence today. Congratulations to you for deciding to read something on the matter and for taking some time to invest into that area of your life! 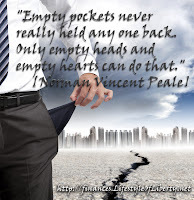 I must first say that nothing I post here should constitute financial advice or counseling; however, these are principles I have been taught and what I share are stories and opinions from my own personal experience as well as the experiences of those around me and I hope you can find them useful, but please seek competent financial advice from a professional before implementing any types of specifics. I've chosen to share a principle from Orrin Woodward's book RESOLVED: 13 Resolutions for LIFE. The principle I've chosen to share is not the most important principle in my opinion, but it is important. What's more is that I believe this principle is one of the easiest to implement immediately, like right now, and follow through with on a regular basis. Don't get me wrong, none of the principles are easy, per say, but the results of developing financial intelligence are worth it by far. As a good friend of mine, Dan Gilligan, always says, "Money is a lot like air. Most people really only worry about it and think about it a lot when they are running out." What does this mean? Very simply put, no matter what, if a purchase is above a certain price point (that you and your family need to decide upon in advance) you DON'T buy it. At least not for 24 hours. You must sleep on all purchases over this limit, which means you will miss out on a lot of "one day only sales" (at least until they have the same "one day only sale" the following month) in the short term, but you will also miss out on squandering money on things that are wants that will end up being thrown out or sold at garage sales for 10% of what you paid for it. "If you look at money as merely a means of exchange to swap for your latest heart's desire then money will always be your master. If you can somehow see money as a tool in your toolbox, under your control, in your domain, then you'll see that money is your slave." If I had only learned this principle sooner I would have saved myself tens of thousands of dollars in spontaneous purchases of things I simply did not need, or even in some cases didn't want. 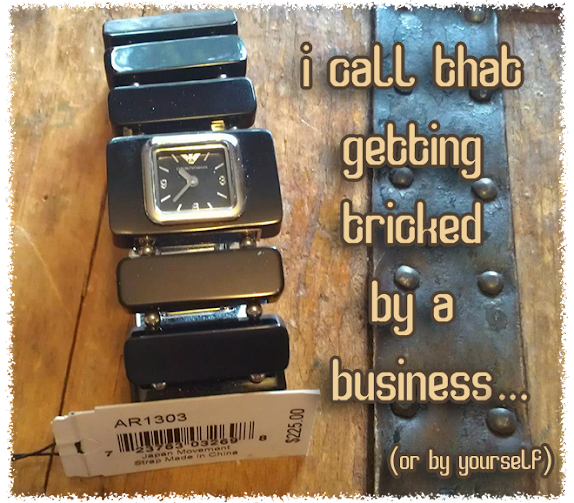 One negative example from my own life I still regret today is an Emporio Armani watch from their Donna Collection (whatever that means...) I paid $225 for this watch at an outlet with a no-returns policy. The next morning I realized I honestly didn't like the thing. (Turns out it is a women's watch) I, to this day, have not been able to find a buyer for this watch even as low as $60 on craigslist and other web sites. Now I have an item I spent $225 for, that I've never worn or used, and I'll be VERY lucky to get $20 for at my next garage sale. "Just being able to sleep on a purchase before making it makes you feel like you have power over your money instead of your money having power over you." A positive example of someone applying the principle correctly would be my great friend Edgar and his wife Dani. When I met Edgar & Dani in 2008 their financial situation was... let's say, special. They had more than their fair share of consumer debt and no real plan to become financially sound. Through applying the Ten Financial Principles they were able to become completely debt free in a matter of a few years, they never finance anything that depreciates, and they genuinely live with a lot lower stress level because finances are sound. I remember back in June of 2012 when Edgar came and asked me about purchasing a laptop. (He was not asking permission, he was asking what technical specs I thought he would need and would fit his budget.) Edgar had saved up more than enough cash to pay for a laptop outright, he had the money and the need for one, but what he did when he found one that fit his budget and the specs, was he slept on it. It was above his spontaneous purchase limit. Edgar began to debate in his mind whether the laptop was really a need or whether it was a want. He actually ended up turning his 24 hour rule into an six month rule. He decided the laptop wasn't a need quite yet. He held off, and delayed his gratification for several months before making the purchase. When I asked him if it was frustrating waiting that long or if it had been worth it he very calmly explained that his family's financial security was more important than the spontaneous purchase and that he does not regret putting as much thought into it as he did. Delayed gratification is something we all struggle with, but need to learn. In fact, it's one of Robert Kiyosaki's Three Keys to Wealth. What Edgar realizes that we all need to realize is that not buying something you don't have money for is not delayed gratification. If you can't afford a new car and you don't buy it, that is not delayed gratification. It is when we can afford something, without financing it, and we still choose to hold off. Following the spontaneous purchase limit and cooling-off period is a great step toward building delayed gratification. What should my spending limit on spontaneous buys be? This really needs to be a personal choice that is discussed with the family. However, I know someone, whose financial advice I trust, who makes several million dollars a year income. This individual has a spontaneous purchase limit of $500. So if a millionaire limits himself at $500 I would think ours should be A LOT less. Now we probably can't do this proportionally or many of us would have to sleep on 5 cent purchases overnight, but find something that works for you. Maybe it's $100, for me and my family we set a limit of $50. Hopefully that gives you a starting place to think about where yours needs to be and I'm very interested to hear any stories you may have about how following this principle has helped you. Please visit back after you've tried it out for a week or a month and let me know how it's going! "Get good at denying yourself. You will almost never regret denying yourself some material possession, for at least a period of time." 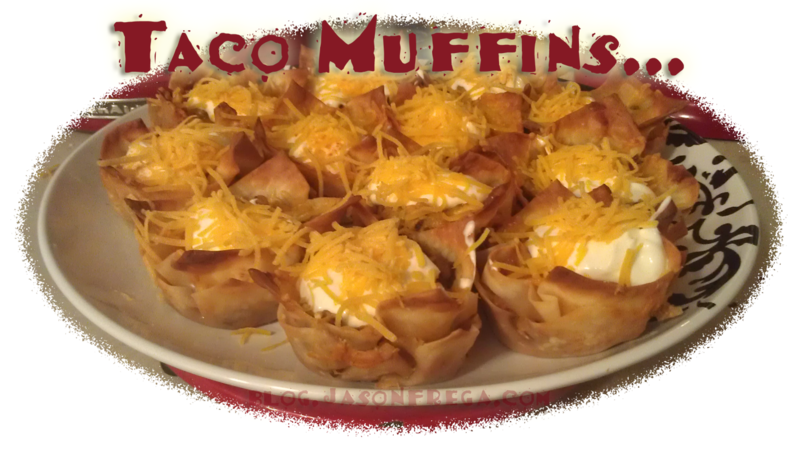 Taco Muffins!... 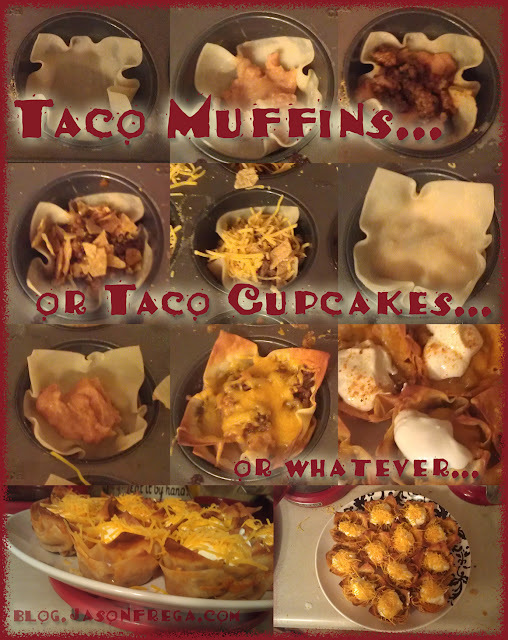 Or Taco Cupcakes... or whatever. So, I had planned to make my next post something with a little bit more substance but I saw this idea on Pinterest and had to try it. The problem was that it was solely an image of the food with no instructions or recipe linked with it so I had to PDCA (plan, do, check, and adjust) my way through it. This made me think, "Hey, maybe someone else would not only enjoy these awesome om noms, but would also like a tutorial on how to make them." So not only do I get to procrastinate coming up with more serious business to post, you get to make yourself a treat! As much shredded cheddar or taco mix cheese as you like! Any tomatoes or chives or rabbit food you think you must add to this to make it look healthy. You're going to want to start by cooking the 1/2 lbs of meat (I tried the recipe with 1/4 lbs, it was NOT enough) according to the instructions on your Lawry's packet, but basically brown the meat up in a skillet, drain the grease, add the 1/2 packet (because you're using 1/2 the amount of meat the packet is meant for) and the 1/3 cup of water, bring to a boil stirring well, and finally lower heat and let simmer uncovered for five minutes. 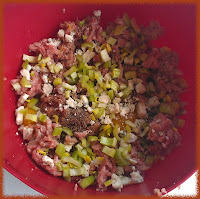 Cook the meat with the spices (see details above). Spray a muffin tin (I used one with 12 spots for muffins) with cooking spray. 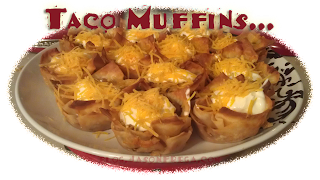 Line each space in muffin tin with one won-ton wrap. Smash a small spoonful of refried beans into each won-ton wrap. Add a spoonful of your seasoned, cooked meat on top of the refried beans. Crumble up your hand-fulls of chips and sprinkle some on top of each pile of meaty-beany-goodness. This is a fantastic time to start pre-heating your oven to 400º F it'll be ready just in time assuming you work at the exact same pace as I do, which is really slow. Smash another won-ton wrap on top of the mixture in each slot, make room for more fillings. Repeat steps 4, 5 and 7 (I left out the chips on the top layer) only don't smash the beans this time or the won-ton wrap will come up with the spoon because of the bean-stickiness effect. Also you can add more of your cheese on this layer than on the first layer because you don't have to fit anything more in the tin now. You will now place the muffin tin into your 400º pre-heated Oven for EXACTLY 18 Minutes. If you put it in for any shorter they won't brown and hold together well enough, if you put it in for any longer I will find out from your Instagram photos of your food and I shall be very cross with you. Add yet some more of your shredded cheese to the top. Leave me a Comment below and let me know how they turned out! I'd genuinely love to know what you think, even if you think I messed up and your way is better! Enjoy! © 2012 Jason J. Frega . Powered by Blogger.